Michigan was a No. 3 seed last year but is on the No. 2 line this season. Michigan began its run to last year’s NCAA title game by beating an opponent from the Big Sky Conference. And in what ranks as a major oddity, the Wolverines will be playing the same exact squad in the first round of this year’s NCAA Tournament. Introductions will not be in order when second-seeded Michigan (28-6) takes on 15th-seeded Montana (26-8) on Thursday in West Region play at Des Moines, Iowa. It could be seen as a bit of an unfair draw for the Grizzlies, who play in a one-bid league. Michigan won last year’s matchup 61-47 behind 20 points and 11 rebounds from guard Charles Matthews. Neither team will need to be reminded that the Grizzlies scored the game’s first 10 points before the Wolverines awoke. The victory was the first of five for Michigan before it was outclassed 79-62 by Villanova in the national championship game. The Wolverines faced elimination in the second round against Houston before guard Jordan Poole drained a decisive 3-pointer as time expired. Michigan was a No. 3 seed last year but is on the No. 2 line this season despite losing 65-60 to Michigan State on Sunday in the Big Ten tournament final. Matthews, a senior, took the seeding as a compliment. 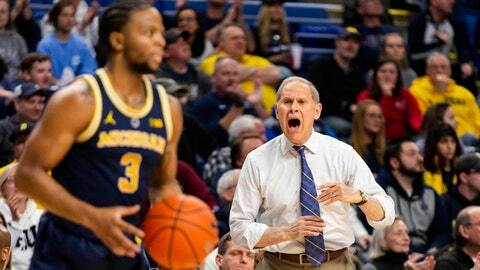 Wolverines coach John Beilein is more worried about the opponent than the seeding. He hasn’t forgotten that game-opening run by the Grizzlies. The Grizzlies have won 52 games over the past two seasons — the best run in program history — and are part of the NCAA field for the fifth time since 2009-10. Seeing the same opponent in back-to-back tourneys wasn’t what they had in mind, but senior guard Bobby Moorehead said all they can do is make the best of the situation. Senior guard Ahmaad Rorie (15.1 average), junior guard Sayeed Pridgett (15.0) and senior guard Michael Oguine (13.2) form a productive trio for the Grizzlies. Montana senior center Jamar Akoh has missed the past 12 games with a knee injury. He averages 15.5 points and 8.7 rebounds. Freshman forward Ignas Brazdeikis leads Michigan with an average of 15.1 points per game. Poole, a sophomore averaging 12.8 points, and Matthews (12.0) also contribute double-digit points.